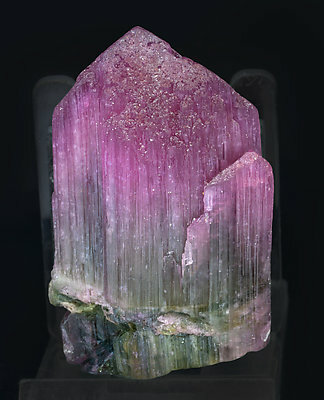 A striated crystal with a very acute rhombohedral termination, translucent and with a pronounced color zoning, green at the bottom and between red and deep pinkish from there to the top, a change of color that corresponds to two different growth phases. The sample, from one of the great classic mineral localities in Madagascar, is from the Carlos Curto collection whose original label and also a copy of the computer card with the full text in the collection catalog we’ll send to the buyer. Single crystal formed by the dominant faces of a ditrigonal prism and the terminal faces of a pyramid and pinacoid that are all very well defined. 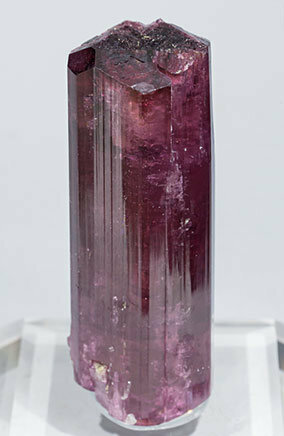 The crystal is between translucent and transparent, very bright and has an intense and uniform color, between red and mauve.